Kent, a top 20 research university, provides a dynamic and challenging academic environment informed by an international perspective and collaboration with top ranked universities around the world. Our £11 million postgraduate scholarship fund allows us to support excellence and we have an enviable record for graduate employment. Kent is known as 'the UK's European university' with campuses in the UK and specialist postgraduate centres in Brussels, Paris, Athens and Rome where studies are underpinned by the specialist resources of each location. In addition to these centres, we have a large number of academic partnerships across Europe, Asia and the United States; some of our programmes offer dual UK and European qualifications, as well as jointly supervised PhD awards. The University is ranked 17th in the UK for research intensity, we have world-leading research in all subjects and 97% of our research is deemed to be of international quality as shown by the Research Excellence Framework 2014. The QAA (2015) recognised postgraduate study at Kent as having 'a vibrant and interdisciplinary academic community'. 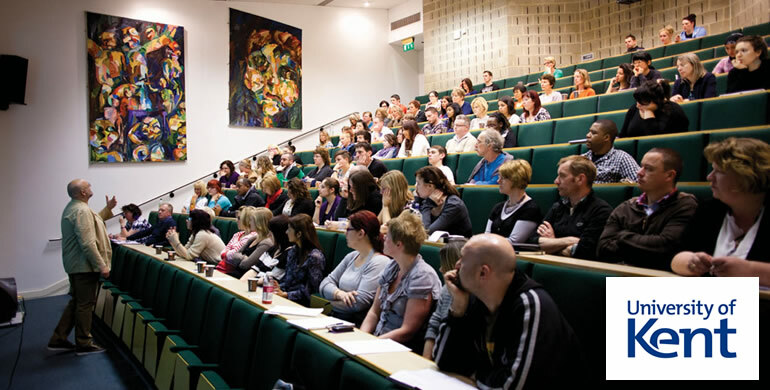 We offer a range of taught programmes and research opportunities including External PhDs, distance learning and short courses across the arts and humanities, social sciences, medical studies, and science and technology. We are active partners in the AHRC Consortium for the Humanities and the Arts South-East England (CHASE), the ESRC South-East Network for Social Sciences (SeNSS), the Eastern Academic Research Consortium (Eastern ARC) and the ARIES NERC Doctoral Training Partnership. The University of Kent has exceptional study locations: the UK campuses in Canterbury, Medway and Tonbridge, and specialist postgraduate centres in Brussels, Paris, Athens and Rome. Canterbury and Medway have quick and easy road and rail access to London as well as mainland Europe, including Paris and Brussels, via the Eurostar. The facilities of all our locations are available to all our students, no matter where they are based. The School is at the centre of contemporary global debates about environmental change, human evolution, biodiversity loss and the response of distinctive social-cultural communities to globalisation and our expertise is broadly encompassed within four research pillars: Biological Anthropology; Socio-cultural Anthropology; Conservation Biology and Human Ecology. Due to the international and significant impact of our research the School attracts grants and scholarships from funders including Leverhulme Trust, ESRC, NERC, European Research Council and various government and non-government agencies around the world. We have been especially successful in winning Darwin Initiative projects securing more funds than any other University in the UK. We have worked in over 80 countries and currently have projects in many diverse locations including Western Ghats India, Aceh Indonesia, Niger West Africa, Panama Central America, East Timor South East Asia, and Madagascar and Seychelles in the Indian Ocean. We publish in some of the world’s most prestigious journals in our fields (Nature, PNAS, Cultural Anthropology, Journal of Human Evolution) and in the most recent Research Assessment Exercise, 55% of our research was rated ‘world-leading’ or ‘internationally excellent’. Our active research expertise, internal research profile and diverse community make Kent an excellent choice for postgraduate studies. Anthropology prides itself on its inclusive and interdisciplinary focus. It takes a holistic approach to human society, combining biological and social perspectives. We offer a range of MA, MSc and PhD programmes across the fields on Environmental, Social, Biological and Visual Anthropology and also Ethnobotany. Conservation programmes, delivered through DICE, seek to integrate international conservation and development sustainability through combining natural and social sciences to design measures that help to conserve biological diversity. We also offer a PhD in Biodiversity Management which attracts highly motivated students from around the world who then go on to highly successful careers in academia or in top flight jobs in biodiversity conservation. The School of Engineering and Digital Arts has an excellent reputation, recognised for both the quality of our teaching and impact of our research, within a friendly and supportive environment. We are consistently first for student satisfaction in major league tables and offer an inspiring and challenging student experience in a safe and very pleasant environment with the beautiful and historic city of Canterbury. We prepare our students for a wide range of occupations enabling them to pursue dynamic professional careers in the UK and overseas. A forward looking School, our courses are regularly reviewed, ensuring that they are up-to-date, contain strong industrial and research input and are relevant to employers’ needs. The School was established over 40 years ago and has developed a top-quality teaching and research base, receiving excellent ratings in both research and teaching assessments. The School is engaged in high-quality research with significant national and international impact while offering excellent opportunities for graduate studies. We have been consistently attracting substantial research funding from the UK Research Councils, European research programmes, industrial and commercial companies, government agencies and others and our spread of expertise allows us to respond rapidly to new developments. Our 31 academic staff and over 130 postgraduate students and research staff form teams providing an ideal focus to effectively support a high level of research activity. There is a thriving student population studying for postgraduate degrees in a notably friendly and supportive teaching and research environment. A postgraduate qualification from Kent opens up a wealth of career opportunities by providing an impressive portfolio of skills and specialist knowledge. Employers recognise that a postgraduate qualification demonstrates a wide range of skills. During your programme, you acquire a high level of academic knowledge and specialist practical skills. Graduates from our postgraduate programmes have excellent employment prospects. We are 7th place across the sector in the Complete University Guide 2014 for employability, and 90% of our graduates take up work or are in further study six months after graduate. This is testimony to our strong links with industry. Our graduates have gone on to achieve great success in leading global organisations. We would encourage you to read our student and alumni profiles which appear on our web site. We have research funding from the UK Research Councils, European research programmes, a number of industrial and commercial companies and government agencies – such as the Ministry of Defence, and many others. Our Electronic Systems Design Centre and Digital Media Hub provide training and consultancy for a wide range of companies. Many of our research projects are collaborative, and we have well-developed links with institutions worldwide. As a postgraduate student, you are part of a thriving research community and receive support through a wide-ranging programme of individual supervision, specialised research seminars, general skills training programmes, and general departmental colloquia, usually with external speakers. We encourage you to attend and present your work at major conferences, as well as taking part in our internal conference and seminar programmes. The atmosphere of our School is informal, friendly and has at its centre, a thriving and diverse postgraduate community from all over the world. We also have a lively community of students and graduates participating in our social media communities on Facebook and Twitter which you are encouraged to be a part of. Staff publish regularly and widely in journals, conference proceedings and books. Among others, they have recently contributed to: IEEE Transactions; IET Journals; Electronics Letters; Applied Physics; Computers in Human Behaviour. Details of recently published books can be found on our research web pages. £2 million to provide a variety of financial support opportunities for postgraduate students. These range from a generous number of research student scholarships, through to location specific funding, sport and music scholarships, and funding specifically for overseas fee-paying students. In addition to University scholarships, the School of Engineering and Digital Arts also offers a number of generous funding schemes, designed to assist worthy students in undertaking postgraduate study. The University of Kent’s School of Sport and Exercise Sciences is located at Chatham’s historic docklands. The school is one of the most exciting and innovative sports schools in the UK. Our aim is to establish the University of Kent as a leading institution in the UK for the study of sport. Previously the Centre for Sports Studies, the school provide academic degrees at undergraduate and postgraduate level. The school produce high-quality research in two distinct areas: (1) Endurance Exercise Research and (2) Sports Therapy & Health Research. To support this research, a recent investment of £850,000 was made as an addition to the £11 million project developing Medway Park facilities to create a regional centre for sporting excellence and research; Medway Park was designated as an Olympic and Paralympic training venue. Facilities include a swimming pool, athletics track, sports halls, sport science laboratories, sports therapy clinics, fitness suite and spa. We are a research-intensive School of Sport and Exercise Science ranked 11th in our field amongst UK universities according to the Guardian University Guide 2015. The school operates within a leading UK University, also ranked within the top 20 of UK universities in the Guardian University Guide 2015. Our school produces rigorous and applicable knowledge, develops employable graduates and impacts the training and performance of coaches and athletes. We have recognized expertise in the fields of: Physiology, Nutrition, Respiratory health, Endurance exercise, Sports therapy and Biomechanics. The School has recently invested heavily in its equipment and other resources, and has world-class sports therapy and sport science facilities. Campus facilities include a 12-couch teaching clinic and a state-of-the-art sports and human performance testing laboratory. There is a wide range of equipment, including treadmills, cycle ergometers, an isokinetic dynamometer, blood and gas analysis equipment. In addition, at Medway Park, the School has its own cutting-edge sports therapy clinic, rehabilitation gymnasium and sports science laboratories. There is also a hypoxic environmental chamber, and analytical chemistry, respiratory testing and psychobiology laboratories. These specialist rooms have been set up with over £850,000 of new equipment, including an AlterG treadmill, a 3D video analysis system, 2D force pedals, ultra-sound imaging, near-infrared spectroscopy and a gait analysis system. The school operates a commercial sports injury and rehabilitation clinic from Medway Park to support elite athletes, regional squads and local residents. As a postgraduate student, you have the opportunity to develop your professional skills as you work with clients in the clinic and laboratory under staff supervision. • Endurance Research Group – endurance performance includes not only exercise tolerance and traditional endurance sports like road cycling, but any kind of performance in which resistance to fatigue is important. • Sports Therapy, Physical Activity and Health Research Group – the aim of this research group is to apply sport and exercise sciences to research in sports therapy, health behavior and various patient groups.